After several years of having a desktop at home that’s been unplugged and unused I decided that it was time to make a home server to do some of my development on and just to keep files stored safely and redundantly. This was in August 2011. A lot has happened since then. First of all, I rebuilt the OpenIndiana (an Illumos-based distribution) setup with SmartOS (another Illumos-based distribution). Since I wrote most of this a long time ago, some of the information below is obsolete. I am sharing it anyway since others may find it useful. Toward the end of the post, I’ll go over SmartOS rebuild. As you may have guessed, the hostname for this box ended up being Isis. First of all, I should list my goals. The obvious mix for digital photos, source code repositories, assorted documents, and email backup is easy enough to store. It however becomes a nightmare if you need to keep track where they are (i.e., which of the two external disks, public server (Odin), laptop drives, desktop drives they are on). Since none of them are explicitly public, it makes sense to keep them near home instead on my public server that’s in a data-center with a fairly slow uplink (1 Mbit/s burstable to 10 Mbits/s, billed at 95th percentile). I have a fast enough laptop (Thinkpad T520), but a beefier system that I can let compile large amounts of code is always nice. It will also let me run several virtual machines and zones comfortably — for development, system administration experiments, and other fun stuff. I have an old Linksys WRT54G (rev. 3) that has served me well for the years. Sadly, it is getting a bit in my way — IPv6 tunneling over IPv4 is difficult, the 100 Mbit/s switch makes it harder to transfer files between computers, etc. If I am making a server that will be always on, it should handle effortlessly NAT’ing my Comcast internet connection. Having a full-fledged server doing the routing will also let me do better traffic shaping & filtering to make the connection feel better. Now that you know what sort of goals I have, let’s take a closer look at the requirments for the hardware. While each one of them is pretty easy to accomplish, their combination is much harder to achieve. Also note that it is ordered from most to least important. As you will see, reliability dictated many of my choices. Seagate Barracuda Green ST2000DL003 2TB 5900 RPM SATA 6.0Gb/s 3.5"
To measure the power utilization, I got a P3 International P4400 Kill A Watt Electricity Usage Monitor. All my power usage numbers are based on watching the digital display. I’ve read Constantin’s OpenSolaris ZFS Home Server Reference Design and I couldn’t help but agree that ECC should be a standard feature on all processors. Constantin pointed out that many more AMD processors support ECC and that as long as you got a motherboard that supported it as well you are set. I started looking around at AMD processors but my search was derailed by Joyent’s announcement that they ported KVM to Illumos — the core of OpenIndiana including the kernel. Unfortunately for AMD, this port supports only Intel CPUs. I switched gears and started looking at Intel CPUs. In a way I wish I had a better reason for choosing Intel over AMD but that’s the truth. I didn’t want to wait for AMD’s processors to be supported by the KVM port. So, why did I get a 3.2GHz Xeon (E3-1230)? I actually started by looking for motherboards. At first, I looked at desktop (read: cheap) motherboards. Sadly, none of the Intel-based boards I’ve seen supported ECC memory. Looking at server-class boards made the search for ECC support trivial. I was surprised to find a Supermicro motherboard (MBD-X9SCL-O) for $160. It supports up to 32 GB of ECC RAM (4x 8 GB DIMMs). Rather cheap, ECC memory, dual gigabit LAN (even though one of the LAN ports uses the Intel 82579 which was unsupported by OpenIndiana at the time), 6 SATA II ports — a nice board by any standard. This motherboard uses the LGA 1155 socket. That more or less means that I was “stuck” with getting a Sandy Bridge processor. :-D The E3-1230 is one of the slower E3 series processors, but it is still very fast compared to most of the other processors in the same price range. Additionally, it’s “only” 80 Watt chip compared to many 95 or even 130 Watt chips from the previous series. There you have it. The processor was more or less determined by the motherboard choice. Well, that’s being rather unfair. It just ended up being a good combination of processor and motherboard — a cheap server board and near-bottom-of-the-line processor that happens to be really sweet. Now that I had a processor and a motherboard picked out, it was time to get RAM. In the past, I’ve had good luck with Kingston, and since it happened to be the cheapest ECC 4 GB DIMMs on NewEgg, I got 4 — for a grand total of 16 GB. I will let you know a secret. I love hotswap drive bays. 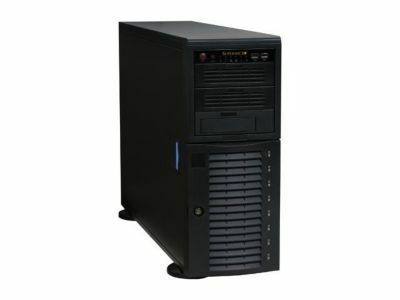 They just make your life easier — from being able to lift a case up high to put it on a shelf without having to lift all those heavy drives at the same time, to quickly replacing a dead drive without taking the whole system down. 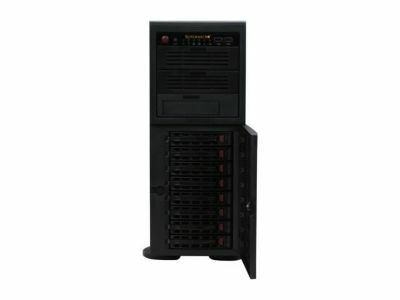 I like my public server’s case (Supermicro CSE-743T-645B) but the 645 Watt power supply is really an overkill for my needs. The four 5000 RPM fans on the midplane are pretty loud when they go full speed. I looked around, and I found a 500 Watt (80%+ efficiency) variant of the case (CSE-743-500B). Still a beefy power supply but closer to what one sees in high end desktops. With this case, I get eight 3.5" hot-swap bays, and three 5.25" external (non-hotswap) bays. This case shouldn’t be a limiting factor in any way. I intended to move my DVD+RW drive from my desktop but that didn’t work out as well as I hoped. 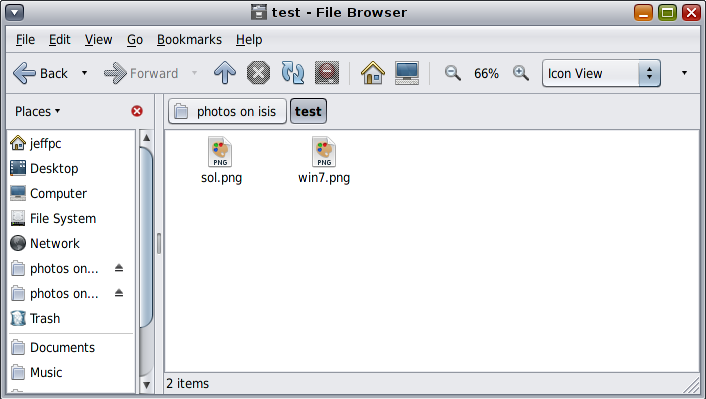 At the time I was constructing Isis, I was experimenting with ZFS on OpenIndiana. I was more than impressed, and I wanted it to manage the storage on my home sever. ZFS is more than just a filesystem, it is also a volume manager. In other words, you can give it multiple disks and tell it to put your data on them in several different ways that closely resemble RAID levels. It can stripe, mirror, or calculate one to three parities. Wikipedia has a nice article outlining ZFS’s features. Anyway, I strongly support ZFS’s attitude toward losing data — do everything to prevent it in the first place. 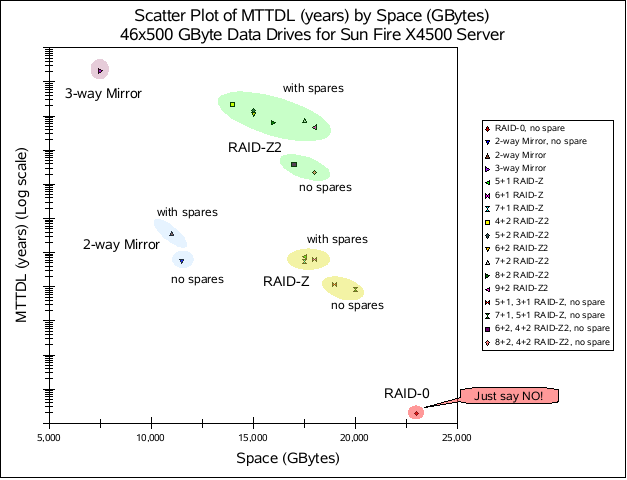 While this scatter plot is for a specific model of a high-end server, it applies to storage in general. I like how the various types of redundancy clump up. Anyway, how much do I care about my files? Most of my code lives in distributed version control systems, so losing one machine wouldn’t be a problem for those. The other files would be a bigger problem. 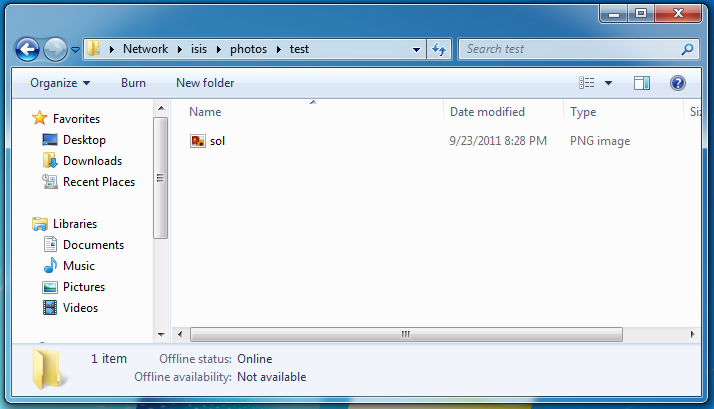 While it wouldn’t be a complete end of the world if I lost all my photos, I’d rather not lose them. This goes back to the requirements list — I prefer reliable over spacious. That’s why I went with 3-way mirror of 2 TB Seagate Barracuda Green drives. It gets me only 2 TB of usable space, but at the same time I should be able to keep my files forever. These are the data drives. I also got two 2.5" 160 GB Western Digital laptop drives to hold the system files — mirrored of course. Around the same time I was discovering that the only sane way to keep your files was mirroring, I stumbled across Constantin’s RAID Greed post. He basically says the same thing — use 3-way mirror and your files will be happy. Now, you might be asking… 2 TB, that’s not a lot of space. What if you out grow it? My answer is simple: ZFS handles that for me. I can easily buy three more drives, plug them in and add them as a second 3-way mirror and ZFS will happily stripe across the two mirrors. I considered buying 6 disks right away, but realized that it’ll probably be at least 6-9 months before I’ll have more than 2 TB of data. So, if I postpone the purchase of the 3 additional drives, I can save money. It turns out that a year and a half later, I’m still below 70% of the 2 TB. I knew that one of the on-board LAN ports was not yet supported by Illumos, and so I threw a PCI-e Gigabit ethernet card into the shopping cart. I went with an Intel gigabit card. Illumos has since gained support for 82579-based NICs, but I’m lazy and so I’m still using the PCI-e NIC. As the ordered components started showing up, I started assembling them. Thankfully, the CPU, RAM, motherboard, and case showed up at the same time preventing me from going crazy. The CPU came with a stock Intel heatsink. The system started up fine. I went into the BIOS and did the usual new-system tweaking — make sure SATA ports are in AHCI mode, stagger the disk spinup to prevent unnecessary load peaks at boot, change the boot order to skip PXE, etc. While roaming around the menu options, I discovered that the motherboard can boot from iSCSI. Pretty neat, but useless for me on this system. The BIOS has a menu screen that displays the fan speeds and the system and processor temperatures. With the fan on the heatsink and only one midplane fan connected the system ran at about 1°C higher than room temperature and the CPU was about 7°C higher than room temperature. Anyway, it was time to install OpenIndiana. I put my desktop’s DVD+RW in the case and then realized that the motherboard doesn’t have any IDE ports! Oh well, time to use a USB flash drive instead. At this point, I had only the 2 system drives. I connected one to the first SATA port, put a 151 development snapshot (text installer) on my only USB flash drive. The installer booted just fine. Installation was uneventful. The one potentially out of the ordinary thing I did was to not configure any networking. Instead, I set it up manually after the first boot, but more about that later. With OI installed on one disk, it was time to set up the rpool mirror. I used Constantin’s Mirroring Your ZFS Root Pool as the general guide even though it is pretty straight forward — duplicate the partition (and slice) scheme on the second disk, add the new slice to the root pool, and then install grub on it. Everything worked out nicely. I powered it off, put in the extra ethernet card I got, and powered it back on. To my surprise, the new device didn’t show up in dladm. I remembered that I should trigger the device reconfiguration. A short touch /reconfigure && reboot later, dladm listed two physical NICs. As you can see, I decided that the routing should be done in a zone. This way, all the routing settings are nicely contained in a single place that does nothing else. Setting up the virtual interfaces was pretty easy thanks to dladm. Setting the static IP on the global zone was equally trivial. You might be wondering about the vlan11 interface that’s on a separate VLAN. The idea was to have my WRT54G continue serving as a wifi access point, but have all the traffic end up on VLAN #11. The router zone would then get to decide whether the user is worthy of LAN or Internet access. I never finished poking around the WRT54G to figure out how to have it dump everything on a VLAN #11 instead of the default #0. OpenSolaris (and therefore all Illumos derivatives) has a wonderful feature called zones. It is essentially a super-lightweight virtualization mechanism. While talking to a couple of people on IRC, I decided that I, like them, would use a dedicated zone as a router. Just before I set up the router zone, the storage disks arrived. The router zone ended up being stored on this array. See the storage section below for details about this storage pool. After installing the zone via zonecfg and zoneadm, it was time to set up the routing and firewalling. First, install the ipfilter package (pkg install pkg:/network/ipfilter). Now, it is time to configure the NAT and filter rules. IPFilter is a bit trickier to set up. The rules need to handle more cases. In general, I tried to be a bit paranoid about the rules. For example, I drop all traffic for IP addresses that don’t belong on that interface (I should never see 10.0.0.0/24 addresses on my ISP interface). The only snag was in the defaults for the ipfilter SMF service. By default, it expects you to put your rules into SMF properties. I wanted to use the more old-school approach of using a config file. Thankfully, I quickly found a blog post which hepled me with it. As the list of components implies, I wanted to make two arrays. I already mentioned the rpool mirror. Once the three 2 TB disks arrived, I hooked them up and created a 3-way mirror (zpool create storage mirror c2t3d0 c2t4d0 c2t5d0). I suspected that there would be enough files that would be stored several times — system binaries for zones, clones of source trees, etc. ZFS has built-in online deduplication. This stores each unique block only once. It’s easy enough to turn on: zfs set dedup=on storage. Additionally, ZFS has transparent data (and metadata) compression featuring LZJB and gzip algorithms. After a while, I came to the realization that for most workloads I run, dedup was wasteful and I would be better off disabling dedup and enabling light compression (i.e., LZJB). For good measure, I rebooted to make sure things would come up properly — they did. Since the server is not intended just for me, I created the other user account with a home directory in storage/home/holly. I intend to use zones extensively. To keep their files out of the way, I decided on storage/zones/$ZONE_NAME. I’ll talk more about the zones I set up later in the Zones section. Local storage is great, but there is only so much you can do with it. Sooner or later, you will want to access it from a different computer. There are many different ways to “export” your data, but as one might expert, they all have their benefits and drawbacks. ZFS makes it really easy to export data via NFS and SMB. After a lot of thought, I decided that SMB would work a bit better. The major benefit of SMB over NFS is that it Just Works™ on all the major operating systems. That’s not to say that NFS does not work, but rather that it needs a bit more…convincing at times. This is especially true on Windows. The home directory shares are all done. The photos share, however, needs a bit more work. Specifically, it should be fully accessible to the users that are supposed to have access (i.e., jeffpc & holly). The easiest way I can find is to use ZFS ACLs. First, I set the aclmode to passthrough (zfs set aclmode=passthough storage). This will prevent a chmod(1) on a file or directory from blowing away all the ACEs (Access Control Entries?). Then on the share directory, I added two ACL entries that allow everything. The first two chmod commands prepend two ACEs. The next three remove ACE number 2 (the third entry). Since the directory started of with three ACEs (representing the standard Unix permissions), the second set of chmods removes those, leaving only the two user ACEs behind. That was easy! In case you are wondering, the Solaris/Illumos SMB service does not allow guest access. You must login to use any of the shares. Aside from the router zone, there were a number of other zones. Most of them were for Illumos and OpenIndiana development. I don’t remember much of the details since this predates the SmartOS conversion. When I first measured the system, it was drawing about 40-45 Watts while idle. Now, I have Isis along with the WRT54G and a gigabit switch on a UPS that tells me that I’m using about 60 Watts when idle. The load can spike up quite a bit if I put load on the 4 Xeon cores and give the disks something to do. (Afterall, it is an 80 Watt CPU!) While this is by no means super low-power, it is low enough and at the same time I have the capability to actually get work done instead of waiting for hours for something to compile. As I already mentioned, I ended up rebuilding the system with SmartOS. SmartOS is not a general purpose distro. Rather, it strives to be a hypervisor with utilities that make guest management trivial. Guests can either be zones, or KVM-powered virtual machines. Here are the major changes from the OpenIndiana setup. SmartOS is one of those distros you do not install. It always netboots, boots from a USB stick or a CD. As a result, you do not need a system drive. This immediately obsoleted the two laptop drives. Conveniently, around the same time, Holly’s laptop suffered from a disk failure so Isis got to donate one of the unused 2.5" system disks. SmartOS calls its data pool “zones”, which took a little bit of getting used to. There’s a way to import other pools, but wanted to keep the settings as vanilla as possible. At some point, I threw in a Intel 160 GB SSD to use for L2ARC and ZIL. In case you are wondering about the features related status message, I created the zones pool way back when Illumos (and therefore SmartOS) had only two ZFS features. Since then, Illumos added one and Joyent added one to SmartOS. I haven’t experimented with either enough to enable it on a production system I rely on so much. The rebuild gave me a chance to start with a clean slate. Specifically, it gave me a chance to get rid off the dedup table. (The dedup table, DDT, is built as writes happen to the filesystem with dedup enabled.) Data deduplication relies on some form of data structure (the most trivial one is a hash table) that maps the hash of the data to the data. In ZFS, the DDT maps the SHA-256 of the block to the block address. The reason I stopped using dedup on my systems was pretty straight forward (and not specific to ZFS). Every entry in the DDT has an overhead. So, ideally, every entry in the DDT is referenced at least twice. If a block is referenced only once, then one would be better off without the block taking up an entry in the DDT. Additionally, every time a reference is taken or released, the DDT needs to be updated. This causes very nasty random I/O under which spinning disks want to weep. It turns out, that a “normal” user will have mostly unique data rendering deduplication impractical. That’s why I stopped using dedup. Instead, I became convinced that most of the time light compression is the way to go. Lightly compressing the data will result in I/O bandwidth savings as well as capacity savings with little overhead given today’s processor speeds versus I/O latencies. Since I haven’t had time to experiment with the recently integrated LZ4, I still use LZJB. You may have noticed that about a week ago my webserver went down. It started off as having to deal with two failed disks in a RAID6, but quickly turned into a system reinstall. There was no data-loss because of hardware failures, but I am sad to say that I accidentally nuked all the blahg post titles and publication times. Additionally, all the comment times and author names are gone. The content for both posts and comments is safe. I’ll try to restore as many posts as possible as soon as possible. It might involve going through archive.org and copying the metadata over. How did the data-loss happen? I forgot to backup extended attributes. My blahging software uses them to store the post metadata. Oops. I finally decided that enough was enough, and I ordered the parts for my new server. This means that in the next week or two, I will be replacing the good ol’ dual Athlon (see below for specs), with a shiny new quad-core Xeon. Baal gives me about 40 GB of disk space (I use RAID 1 across the two drives). Odin will give me about 6TB (RAID 6). This will finally allow me to do a few things I wanted to do for a while; one such thing is to provide a Hercules image with Linux set up to do HVF development.